The CORKEN liquid transfer-vapor recovery compressor is a vertical single-stage, single-acting reciprocating compressor designed to handle flammable gases like LPG and toxic gases such as ammonia. Vertical compressors are also perfect for emergency evacuation purposes. Compressors are available in both threaded and ANSI flanged connections. Usually CORKEN vertical compressors are used in stationary applications in terminals, for railcars unloading and trucks loading/unloading. Compressors have also an extended crankshaft option for utilization on trucks for loading/ unloading as well as vapor recovery, with PTO and hydraulic drive systems. 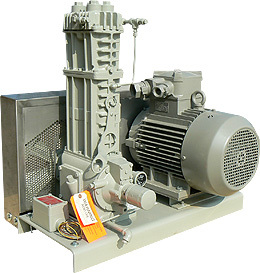 We can supply bare or mounted compressors with Siemens ex proof motors AOM, ExdIIB+H2T4Gb. As every year, we will be present at German national LPG Association Forum & Exhibition 08-09. November 2017, in Würzburg, Germany. Please come to visit us at our booth #25. The Forum & Exhibition will take place this year in Maritim Hotel Würzburg, Pleichertorstraße 5, 97070 Würzburg.